The concept of impending catastrophe is a vivifying force, however, what if we are not the only ones to predict such an event? No matter the harvest, our souls remain consistently within our charge, and deserve the fullest attention. Many civilisations have disappeared in the past, but these were disasters that only affected certain areas of the Earth, not the whole of humanity. Today, for the first time in history, a world civilisation — the global extension of Western civilisation — is threatened by converging lines of catastrophe produced by the implementation of its ideological plans. These ‘converging lines of catastrophe’, according to Faye, would lead to a radical restructuring of the world’s political and social organization, and potentially open new possibilities to human societies which at present seem naught more than mere pipe dreams. It is difficult to avoid the sense that Faye foresees the coming of such disasters with a certain relish. There is no malice in this, but rather the longing of a warrior spirit for hardier and more violently vital times. Faye himself distinguishes between various kinds of catastrophe: broadly speaking, we might categorize them as the economic, the socio-political and the environmental (Faye includes also religious and geopolitical catastrophes in his own taxonomy; I subsume these both under the broader heading of socio-political). As examples of each: An economic break, such as occurred in 2007 and yet more spectacularly in 1929, might produce, given the present level of global economic interdependence, dire ramifications for the societies and the governments of the entire globe. On the socio-political plane, the increasing numbers of terrorist attacks in Europe and the demographic changes being wrought on the countries of all the West (with but pathetic few exceptions), could lead to widespread social decay, the fragmentation of the standing political order, and even civil or religious wars; or again, there are only so many times our governments can shatter the ‘debt ceiling’ before they find themselves floundering in the airless pockets of space, or plummeting into a default which might well be, in the case of the larger countries like the USA, globally devastating far beyond the feverish arenas of Wall Street. 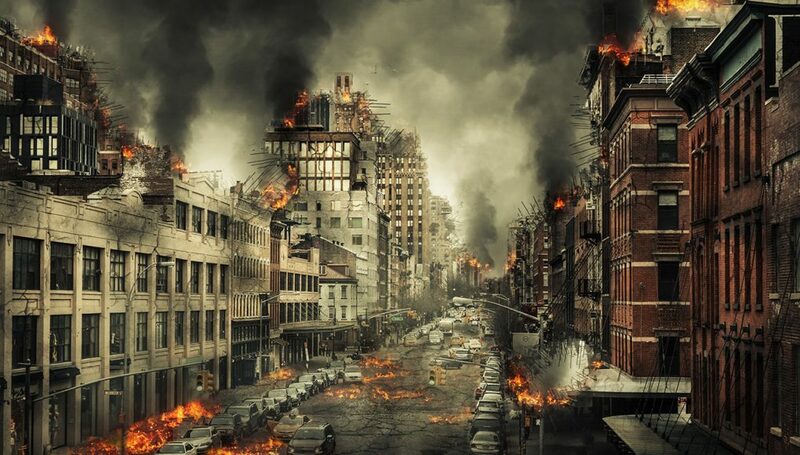 On the environmental level, possibilities include droughts, famines and diseases (such as will be, according to some, the nigh inevitable results of global warming), but also volcanoes, earthquakes, asteroids or somewhat more localized catastrophes, such as typhoons, hurricanes etc. etc. To ignore the possibility of a catastrophe such as those which Faye indicates would be irresponsible of us in the highest degree; for Faye is absolutely right that all the signs point to the coming of at least a single disaster of this order within the century we are presently living, if not to a convergence of several. Nonetheless, the opposite tendency must be as strenuously exorcized: namely, the complacent expectancy of such an event, the resigned awaiting of some deus ex machina which shall descend of its own will to wreak havoc on the organization of our enemies and thereby to provide us a route of entry into the rubbled halls of power. I am convinced that Faye intends his convergence of catastrophes to be the very opposite of a doctrine of complacency; it is meant as a vivifying, regulating idea, one which forces us into awareness of the radical contingency and unpredictability of the future. To the extent that we take it as such, it can do us nothing but good. At the same time, we cannot permit Faye’s idea to transform, quite against his will, into an excuse for stagnation and immobility. For the first danger to this idea is that it appears to preclude the feasibility of any present action, apart from action in the sense of generic preparations for some ill-defined and unforeseeable future event. It is alas all too easy to take it as a pretext for doing nothing. For truly, if it will require nothing less than a global catastrophe to startle our people from their slumber, what good could it possibly do for us to go about scratching at the granite borders of their complacency with essays or protests? Two points must be considered here — two reasons that not mere waiting, but conscious and deliberate action, is absolutely incumbent upon us in the present moment. There is another and more fundamental problem, however, with this kind of philocatastrophism: It seems to presuppose that we are the only ones capable of clearly seeing the possible emergence of catastrophe. Faye indicates as much when he suggests that most of these catastrophes have been made possible precisely by modern ideology and its heedless progressivism. All contemporary liberal observers of our situation are therefore evidently blinded by their meliorism or ingenuity, and simply cannot perceive the possibility that this great Modern ship of progress we have launched might break upon any number of hidden reefs. This would put us at a great advantage, for in our realism and our clear-sighted view of the true impossibility and inner contradictions of ‘liberalism’, we could prepare ourselves for its breakdown, which will be nothing but surprising to most of those who still dwell contentedly within its borders. But although we are the last to deny that a great many progressives in our day, including politicians, intellectuals and men of high station, do indeed suffer from such blindness, even to a criminal degree, there is yet another and far more dangerous category of men who have their eyes very open indeed. I am speaking of the globalists, the Atlanticists, the New World Orderers, or however we would like to call them — in short, the men who are pulling the invisible strings which make our politicasters dance. Whatever we are in a position to see, they are yet moreso. They are, moreover, in a much more favourable position than we to extract profit from any kind of grand economic or social or environmental upheaval. 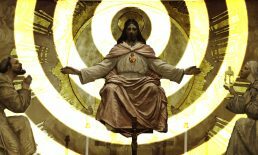 More yet: we know, because we have seen time and time again, that the same individuals who press most importunously for the advent of a future single world government are also those who most like to foment revolutions and economic emergencies in nations throughout the world, both in and out of the West. The so-called colour revolutions, which Soros, to name only the most infamous example, has had his gloved hand upon on countless occasions,v are but one example; idem the economic meltdown that opened this millennium, which was produced by the very same banks that later profited handsomely from it.vi Nor is this anything new; Goldman Sachs came into its power precisely in the Great Depression, which it itself was also partially responsible for causing.vii These men are chaos feeders, who are long accustomed to earning their pilf and winnowing their power from broad regional misfortunes. If a catastrophe arises from a source which no man can predict or control (as for instance an environmental disaster), these men will be ready for it; and if it comes instead from some inner element or aspect of our societies or economies, or from, for instance, some artificial epidemic, they may well be they themselves the architects of such catastrophe, which puts them in a prime position to advance their own agenda through the confusion they themselves have sown. It is therefore clear we cannot depend on catastrophe to save us from our plight; in certain cases, we must even do whatever we can to stave off such catastrophe, when we see that it plays directly into the hands of the men who are our most powerful and truest enemies in this world. Yet it is still occasionally proposed that the European ‘migrant crisis’ is presently resulting in unintended consequences, even so far as these globalists are concerned. I dispute this fact; if there are any ‘unintended consequences’, they are none that these chaos feeders will not know how to work. There is nothing unintentional, for instance, in the fact that jihadists and Islamic revolutionaries are being systematically imported from foreign countries amidst the boatloads of supposed ‘refugees’; the terrorist attacks that these chaos agents inevitably commit provide precisely the excuse the globalists need to tighten the close net of security and to put stronger controls on our freedom of speech; the blood of every man who is cut down in the name of Allah on our shores goes first and foremost to feed the tree of the One World Order. Our politicians sometimes suffer the consequences of popular backlash against unpopular immigration policies; the globalists are more than immune. Obviously, demographic displacement (I would prefer to call it cultural erasure, since that is the real aim; these globalists want neither our demographic nor any other to prevail in the end) has been an abiding goal of theirs since at least as far back as the Kalergi Plan.xi But beyond that, even the very real threat of the establishment of Sharia law in important centres of Europe is far from disadvantageous to them: for should this threat really come to crisis, no better excuse than this could be found to consolidate the power they have already long been gathering, to centralize more strength and unity to the super-political units they have been developing, such as the European Union, the United Nations, NATO, the International Monetary Fund etc. etc., and to construct strong legal and super-legal harnesses which can as easily be slipped around the jaws of nationalists as of religious extremists. It is therefore clear we cannot depend on catastrophe to save us from our plight; in certain cases, we must even do whatever we can to stave off such catastrophe, when we see that it plays directly into the hands of the men who are our most powerful and truest enemies in this world. This demands a degree of awareness of our situation which is not easy to attain; and it is a constant temptation to resort to easy platitudes and to commonplace evaluations of the present state of affairs. 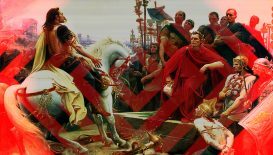 It is easy, for instance, to turn the brunt of our animus against the hostile alien colonists (I use Faye’s apt and precise term here, rather than the more common ‘invaders’) who are now assailing our lands, and whose presence and negative influence is so much more immediate and obvious than any action taken by the occult globalists. But this is precisely what these globalists are counting on. They have had their way now for decades precisely because they act at a level of political and social things which is so far from the common perception that the common people, and even a great many serious thinking men, never catch so much as a glimpse of it. Despite the extraordinary power they exert, most of these men are literally anonymous; any negative reference to them whatsoever on the part of this or that individual can therefore easily be dismissed by the media (over which they exert powerful influence) as ‘conspiracy theory’. We must accustom ourselves to a level of analysis which is at once uncommon and uncomfortable. This is not simply in the interest of some remote or abstract notion of truth — though there is that, as well: but this is really and fundamentally a question of our survival. If we permit our enemies to dwell and move within a sphere which is so broad and so distant that it secretly encompasses our own, our actions will redound to their benefit; we will almost certainly fail in anything we attempt to accomplish. Where, then, does this leave us? I have already discussed one aspect of our present plight: namely, the necessity of preparing our associations for all possible vicissitudes, including a catastrophe of the order which Faye predicts. We must indeed be prepared equally both for a catastrophe which catches the whole world unawares, and for an engineered and deliberate catastrophe, though this last is much more difficult to gauge or plan against. 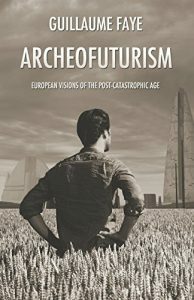 In the same Archeofuturism, Faye takes the French New Right hard to task for its ossifying into a merely intellectual position without any kind of practical manifestations. We must absolutely avoid this pitfall; whatever political action we might taken, whatever successes, even be they small, we can secure on the level of local or regional or national or international politics, must be sought after by us with all the power at our disposal. Even when these represent but half-measures or compromises to our harder and brighter worldview, nonetheless we must recognize that small gains are preferable to great losses. More than anything, we are in need of a new system of education, one which we ourselves begin to build up, which is capable of standing against the debilitating and degenerative tendencies of modern living, and of undermining the diseased academia. One thing remains true above all others: no matter what can or cannot be accomplished on a metapolitical or political level today, no matter what possibilities are open to us or closed in the absence or the coming of catastrophe, there is a single sphere which remains radically within our control, as even the Ancients used to teach: the sphere of our personal lives, our actions, decisions, choices, and our own conscious deeds within, and upon, ourselves. It is noble of us to make attempts to change this world in which we find ourselves, quite regardless of whether or not our attempts might ever bear fruit. But we are compelled both by present necessity and by that same nobility to till a soil which we know can bear fruit: the soil of our souls. Be there storms or doldrums upon this horizon, let us forge ourselves into such men as will know to navigate them both. iiFor instance, La Muvra (mountain trekking and climbing organized by CasaPound to improve the health and strength of its members) and La Salamandra (early response to emergency situations by the members of CasaPound, in teaching them fearlessness and essential first-aid skills) show but the outer limit of the possibilities here, toward the end of a new form of education, a new schooling for life, independent of our by now stagnant and antiseptic academia. Surely, such initiatives can be expanded and improved upon, but the main point now is making a start, and in this CasaPound is miles ahead of most practical endeavours of the Right. ivAbsurd and repulsive as this proposal is, I am not inventing it: and the ecstasy with which certain viewers have received is quite enough to demonstrate the extremity of our situation. The English version can be found here. xSuffice it to make note of the Bilderberg Group, which has met annually in its highly secretive conclaves now without interruption for more than sixty years. xihttps://www.ilprimatonazionale.it/cultura/piano-kalergi-38849/. See also the article in Arktos Journal by Aetius: ‘European Resistance’. I believe that Faye knows her readers well. I am sure that none of them can in the least think that Faye is in favor of some form of determinism. It simply makes a forecast of future catastrophes but this does not mean to praise inaction. He is the first to prove it, for years engaged in the metapolitical struggle. I certainly did not mean to imply anything to the contrary. Rather than accusing Faye himself of complacency, which I agree would be patently inaccurate, I was warning against a tendency which might come of catastrophism in general. However, granting that Faye fully deserves the epithet of activist, I do believe that there is a tendency in his thought toward an almost hopeful expectation of a deep and widespread future instability or even disaster. To identify this aspect of Faye’s thought might not even mean to criticize it; for it may well simply be the case that without some kind of real social or political breakdown, no true transformation of the social order will ever be possible. Of course, even given such an understanding, there is space for activism, as Faye clearly sees and as I hope I have indicated in my article. The danger lies in becoming blind to other possibilities which do not depend on catastrophe, and which might seem to our present secularist and scientistic way of thinking to be improbable in the highest. Insofar as one believes in historical determinism or holds to a rigorous scientific comprehension of human life, these non-catastrophic possibilities verge strongly on impossibility, and I suspect Faye tends to hold such a view. Part of this aspect of Faye’s thought can in my view be ascribed to a paganism which, despite Faye’s proclamations to the contrary, is not always easily disentangled from secularism, if not outright atheism. Put otherwise, I suspect that Faye has inherited Nietzsche’s merely outward teaching on religion. Without the existence of some transcendent realm, over and above simple self-compounding vitalism or a Nietzschean valorization of Life – without a superhistorical sphere which is accessible, of not to man, then to individual men – one wonders in vain what power is capable of salvaging the disastrous case of modernity. And at that point, indeed, it is natural to incline toward catastrophism, even should such appear defeatist. Let’s say that catastrophes are not necessary for a revolution but certainly facilitate its historical existence. For example, I believe that without the First World War the fascisms would never have arisen. I say this because fascism, unlike communism, is not an ideology but a “style of life”. It is no coincidence that in the trenches almost all the historical leaders of European fascism were forged because the weltannschaung of the New Man (and at the same time ancient or better, to use a term dear to Faye, archaic) was born there. And here again, Mr. Cavallini, I can do no other than agree with you entirely. My point — which is of course not at all incompatible with your own — might be put in this way. We owe the very idea of revolution to Modernity; before recent centuries, the concept of ‘revolution’ did not exist. Revolt, certainly; rebellions, uprisings, whatever have you, sparked by the desire to assuage poor conditions or to plunder. But the idea of a popular turn against the social order, with the explicit idea of altering the very regime or constitution of the same, is emphatically modern. It is therefore natural for us to look to it to guide us in our own efforts at social change. Yet modernity itself, by my estimation (and I am not alone in this), is coming to an end. This puts us at a pivotal historical moment, the threshold of a new era; and that which follows might be in any number of ways utterly surprising to us, might open new possibilities for socio-political change which at present are unforeseeable or seem to us strange and outlandish. Just as five hundred years ago anyone who claimed that the aristocracies would be, in the course of a mere three hundred years, utterly destroyed by a liberal-democratic flood would literally have been laughed out of court for mouthing absurdities, so we cannot dismiss the possibility that in another century (supposing we last so long as that), societies might be overturned, or set aright, in fundamentally new ways — and perhaps by a power above them, rather than below them (as in the case of popular revolution) or ‘around’ them (as in the case of catastrophe). 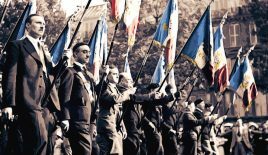 Uncovering a forgotten voice from the French inter-war Right. How can France return to take possession once more of its real being?